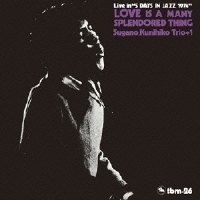 Kunihiko Sugano is a unique jazz pianist who is known for his huge talent, a pianistic approach reminiscent of Erroll Garner, and a sensitive nature that made it difficult for him to play in front of a large audience. Considering the latter issue, the live performances contained in this CD, recorded at a big hall in Tokyo for a jazz festival produced by the Three Blind Mice label, was a huge success. It is mesmerizing to hear Sugano's probing and exploratory introductions, relentless swing once he gets going, and palpable joy of making music on the spot. The trio, augmented with conga player Yoichi Ogawa, does a great job as well. Produced by Takeshi Fujii. Recorded live at Nihon Toshi Center Hall on March 22, 1974. Blu-spec CD is compatible with all regular CD players. Paper sleeve special limited edition.